Members who like this album also like: Anthology Of American Folk Music by Various Artists, Moanin' The Blues by Hank Williams and Talking Dust Bowl by Woody Guthrie. 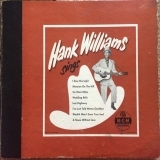 Related links: top tracks by Hank Williams With His Drifting Cowboystop tracks of the 1950s, top tracks of 1951. Showing latest 5 ratings for this album. | Show all 43 ratings for this album. Related links: top albums of the 1950s, top albums of 1951. Oh Hank... How you make me sad. I've never heard a country artist who call pull at the heart strings in such a simple way as Hank Williams. Nice album, Hank always with his perfect voice. Not up to the standards of Moanin' The Blues (the songs aren't as great), but still very nice! best country album I've ever heard.